We have a tradition. When I go back home to visit my family, my mom makes the foods of my childhood that I miss. There’s koupepia, grape leaves stuffed with meat and rice and cooked in a tomato sauce, there’s rabbit stewed in onions and red wine, and there’s always makaronia tou fournou, known as pastitsio in Greece. Over the years, I’ve gotten recipes from my mom so that I could make these dishes myself whenever I wanted to. It’s not very easy. She has no written recipes and her measurements and directions don’t use American standards. When she says a cup of flour, she’s talking about a drinking glass she’s always used to measure. There are no exact times either. You may cook something until “it drinks its water,” meaning that the liquid evaporates, or until it katastithei, which means that its sauce thickens. So, I do my best and transcribe the recipes as well as I can and when I come back to New York I try them out a few times until I get the exact measurements that result in a dish as close to my mom’s as possible. An additional problem is that the ingredients may be different or tough to find. 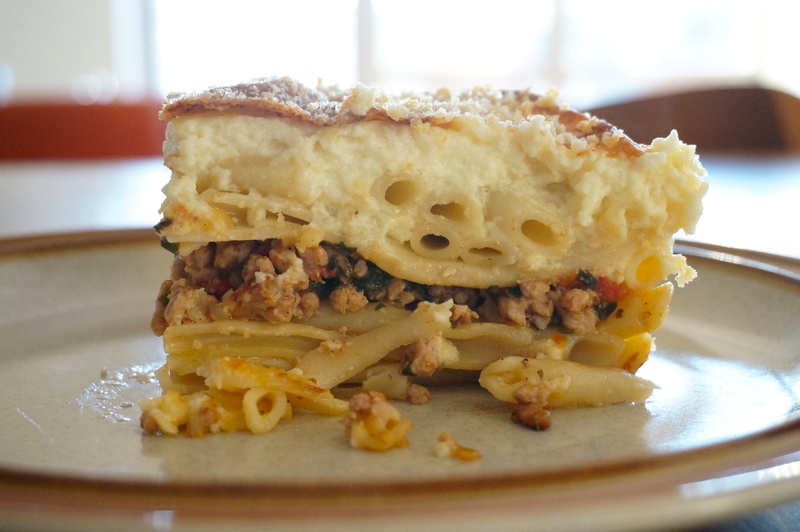 That’s the case, for example, with this recipe for pastitsio. While almost everything is readily accessible in the U.S., the macaroni my mom uses is tough to find. Though, as I explain in the recipe, any round macaroni would work fine. 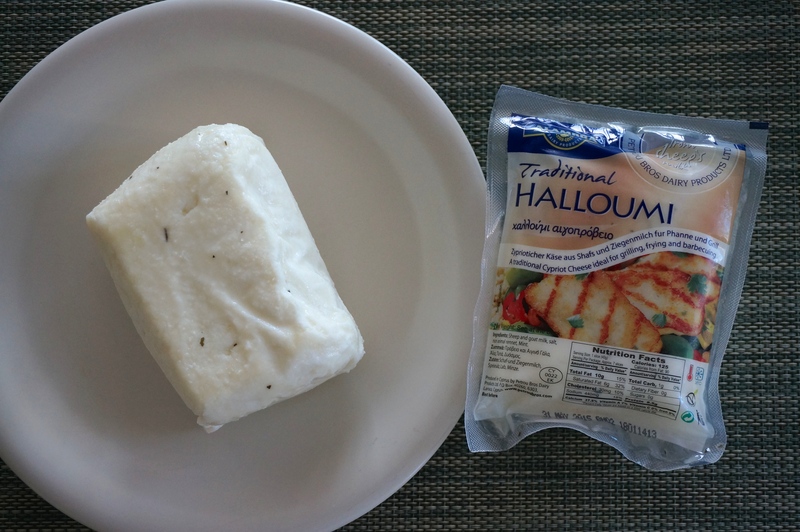 For a while, I couldn’t find halloumi either, the cheese from Cyprus that’s made with sheep and goat milks and has salt and bits of mint in it. It’s famous for not melting, so you can grill it or sauté it in a pan, but here it’s grated and added to the dish. Fortunately, halloumi is now sold in all grocery stores. So, here it is. 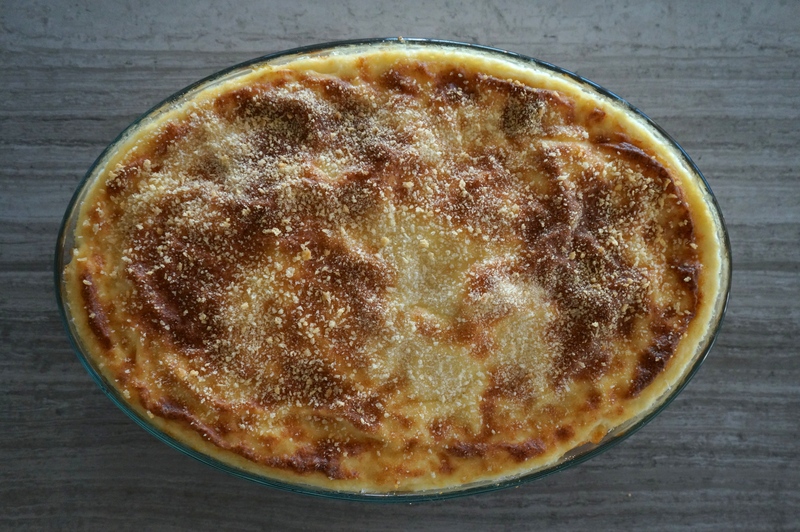 My mom’s recipe for pastitsio or makaronia tou fournou. It’s not a difficult recipe, but it does have several steps. It’s a great project for a Sunday. If you are concerned about the quantity this recipe makes, after the pastitsio is cooked and cools down completely, you can cut it in portions and freeze them, wrapped in plastic. Whenever you want to eat it, defrost it in the fridge overnight and then reheat it in a 300° F oven for 15 minutes or until it’s warm through. Don’t microwave it because it will give it a strong egg taste. I guarantee you that you will not regret making this dish. It’s a perfect combination of pasta, meat, and cream. I’ve been making it myself for years but my mom still makes it for me when I go home. After all, no matter how close my own pastitsio gets to my mom’s, hers is always better. 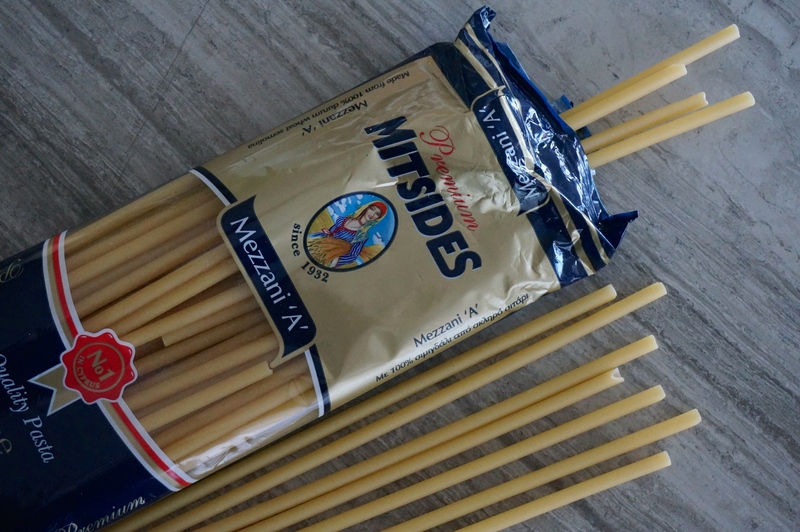 Notes: The pasta my mom uses is Mezzani A. If you can’t find it, use any thick, tube-shaped pasta. The chicken bouillon cubes are essential, so don’t skip them or change them. 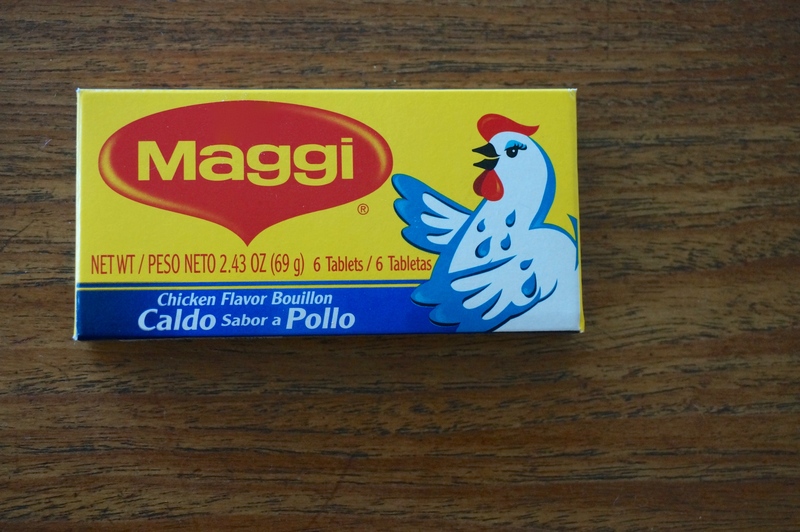 My mom has always used the Maggi brand. Same goes for the halloumi cheese. It’s irreplaceable in the recipe. Fortunately, most grocery stores carry it. First, make the meat layer. Cook the onion in olive oil over medium high heat, stirring often, for about 4 minutes. Add ground meat. Cook for another 5 minutes, stirring often and breaking up any clumps. Add wine, salt and pepper, cinnamon, parsley, 1/2 maggi and tomatoes. Stir together and cook until almost all liquid has evaporated, about 12-15 minutes. Set aside and proceed with the rest of the recipe. DO AHEAD: Meat can be prepared up to 2 days ahead and stored in refrigerator, covered. Then, make the pasta layer. If pasta is long, break into thirds, about 4 inches long. Cook pasta in plenty of unsalted water till al dente. Drain and return to pot. While still hot, add maggi, butter, and egg while stirring until the butter is melted. Add the halloumi. Stir well until everything is combined. Put 3/4 of cooked pasta in bottom of 9 by 13 oval pan that is at least 2 ½ inches deep, then add meat and finally add remaining pasta on top. Make the bechamel. Melt butter in a medium pot over medium heat. When butter melts and begins to bubble, whisk in flour and cook, whisking frequently, until flour is cooked and just begins to turn darker in color about 5 to 6 minutes. Add all the milk at once, whisking continuously until thoroughly combined. Continue to simmer until thickened, about 10 minutes. Lightly beat eggs, temper them with a little of the hot thickened milk, and add carefully to béchamel, whisking constantly. Remove from heat. Add grated halloumi and stir well. Spread bechamel on top of pasta and meat making sure to cover all the way to the edges. Smooth top with back of spoon. Sprinkle breadcrumbs on top and bake at 350° F for about an hour till top is golden brown.